In Adobe InDesign, Photoshop, and other Carbon applications, Default Folder X’s windows and controls could be left on-screen after a Save dialog went away. This will no longer happen in 4.3.5. The latest version of OpenMeta uses a different metadata keyword for storing tags in the extended attributes of files (this was not my choice). Because of this, it needs to ‘upgrade’ any tags that you’ve already attached to your files – it searches for them with Spotlight and makes copies of them under the new names. This is necessary if you want Default Folder X (and other OpenMeta-based tagging tools) to continue reading them, but can bog down your machine if you have lots of tagged files. 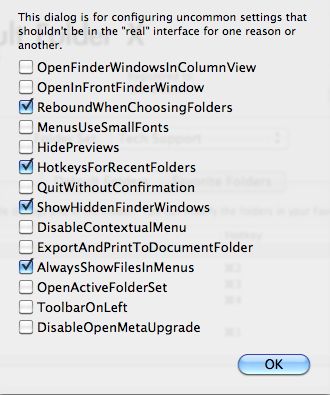 Just turn on that “DisableOpenMetaUpgrade” checkbox at the bottom. Remember that you DO need to run the OpenMeta upgrade eventually or you’ll find that old tags won’t show up when you look at them with Default Folder X (though they’re still there). The one situation where you might want to leave OpenMeta upgrading disabled is if you’re using MailTags to tag your email messages and won’t need to access those tags with DFX or any other OpenMeta tagging tool. Sorry for providing another update so quickly after the last, but it was important to get these changes out, especially #1. We don’t want you to have problems with Save dialogs!